After spending a weekend in Myrtle Beach, South Carolina, I can still remember the first view of the ocean and hearing the sound of the waves. Add a bright blue sky and a light breeze and it was just about perfect. As I walked toward the beach I saw seagulls, sand dunes and people walking their dogs. This was a great start to the weekend. But on Saturday the weather changed and it was gray and rainy most of the day. I didn’t mind because it gave the beach a dreamy appearance. I decided to spend time looking for seashells as souvenirs. I also went to a nearby public sculpture garden to see some beautiful flowers and scenery. Late Saturday afternoon the rain stopped and it was time to enjoy another view of the sand, water and the sky. This was a weekend of interesting contrasts. 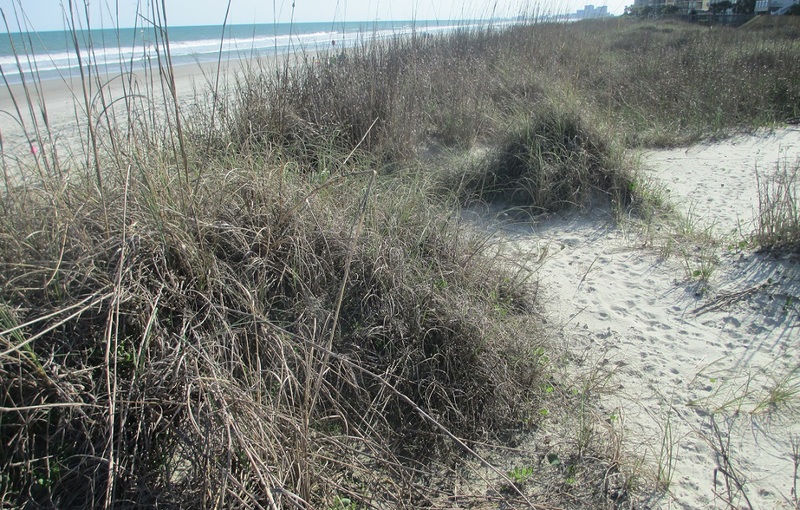 This entry was posted in Myrtle Beach, Travel, USA and tagged beach, ocean, relaxing, seashells. Bookmark the permalink. That would be so wonderful! All in all it was a lot of fun, even with the rain! Those first shots look just like the beach where I grew up in Australia. That’s really interesting to know – your beach must be a beautiful place! I agree – I found some pretty shells while I was walking on the beach! Just found some in a tin in my bureau! It’s nice to be reminded of the beach! Nice photos! The ocean can make things rainy and gray and foggy around here too, but it’s always fun to go for walks like that. Thanks Lola – it was so peaceful and very nice to see people enjoying the beach! How very lovely! Your last shot is stunning! I love to walk along the beach looking for shells. Myrtle Beach and Old Orchard Beach are two of my favorites. Thanks for taking me along, I so enjoyed it! I enjoyed our stops in Myrtle Beach. It looks like you had a bit of everything weatherwise. Ana probably had something to do with that. The weather changed dramatically over the weekend I was there. I like the sunshine best but the beach was just as interesting in the rain! What a wonderful walk. All of Your photos are very beautiful, but my favorite is the last one. 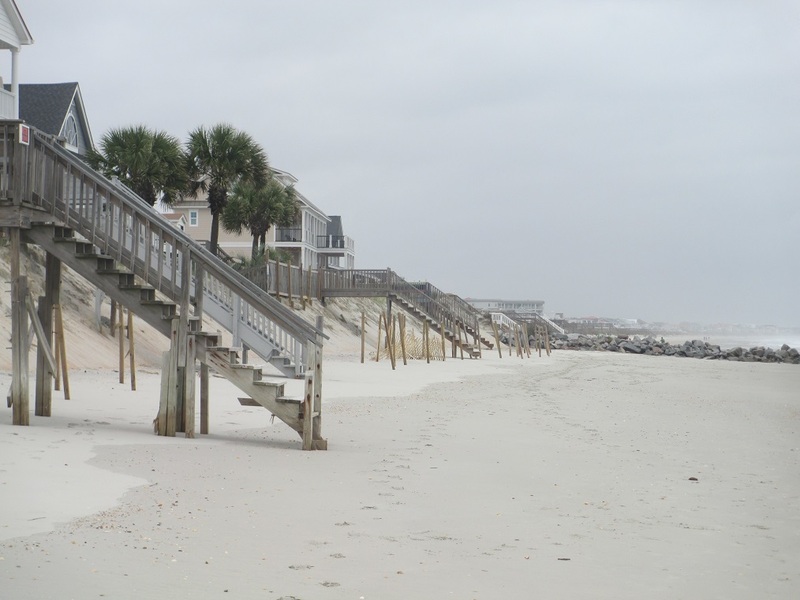 Thank you – it was low tide for the last picture and you could see a lot of the stairways! Definitely contrasting beach scenes and it is nice that you made the most of each day. I grew up vacationing on Myrtle Beach. Back then, it had a pavilion and was a lot less commercial. But the broad beaches of SC and NC are especially inviting, even in the changing weather patterns. It gives it a whole new personality. Such peaceful scenes and colours, even with the rain. Aren’t those houses on the beach front in danger of falling onto the beach?